This interactive documentary installation was presented at the ITP spring 2003 show. The piece is comprised of an 8 minute video loop and 6 channels of audio. 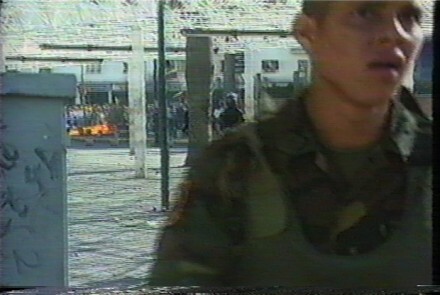 The viewer is given the chance to mix his/her own soundtrack of information to authentic source material from the events of 4/11/02 in Caracas, Venezuela. On 4/11/02, what began as a peaceful protest against Venezuelan president Hugo Chavez turned into an event of chaos and horror. By the end of the day, 19 people were killed and hundreds injured by bullets shot by 5 unseen snipers. To this day, no one knows for whom the snipers worked. The 4/11 installation attempts to give the viewer an environmental sense of what it was like to be both in the midst of the chaos that day and the chaos left in its wake. The video footage, all shot on-site that day (provided uncut by my collaborator, Venezuelan musician/sound engineer Jose Hinestrosa), attempts to weave together multiple perspectives: the street, the media, the military, and palace defenders. The 6 channels of audio represent 6 different sources of information: the spanish speaking media, english speaking media, the sounds of the street, Hugo Chavez (through his speeches), narration (giving context), and a more traditional film-type musical soundtrack. Using the Pic microprocessor, Max/MSP, and old radios, we allow the viewer to control the volumes in real-time, determining the information s/he hears.